From the folks who brought us Wave® Petunias comes this amazing trailing Pansy, which grows bigger, faster, and with better branching. It's like a pansy on steroids, trailing more than 2 feet from baskets, with larger leaves, wider flowers, and a more bushy habit. I tested Cool Wave Pansies in our Wilson Bros. Nursery trial gardens last year and was simply blown away with their performance. Not only do they sprawl and cascade wonderfully in pots and hanging baskets, when planted in garden beds they spread many times the width of other non-trailing pansies. Cool Waves are the most cold hardy pansy I've seen and grown yet. In my landscape here in mid-Georgia, they bloomed heavily without ceasing through almost the entire winter! Simply put, this new pansy beats everything I've seen when it comes to cool weather performance. Their vigorous performance during intense winter climates ranks them supreme for many gardens - not only do their abundant medium-sized blossoms better withstand the cold than larger bloom varieties, but they prove more resistant to rain as well. 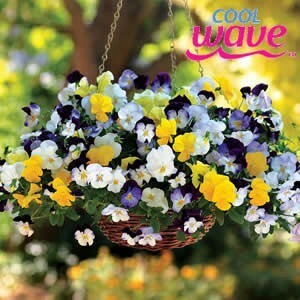 Cool Wave pansies stand only 6 to 8 inches tall, while extending their luxuriant branches up to 2 feet wide! They make a spectacular show as spillers in hanging baskets or patio containers from late fall through spring. Plant a low spreading carpet of color in established flowerbeds or borders for incessant blooms all season. You can grow Cool Wave Pansies singly in hanging baskets or small containers, or create a spectacular yuletide show by integrating these outstanding beauties with ornamental flowering cabbages and kales, snapdragons, diascias, violas, pansies, evergreen ornamental grasses, heuchera, evergreen perennial ferns, and many other cool season plants. Like other pansies and violas, Cool Waves prefer full sunlight and well-drained soil, though they have demonstrated a better resistant to damp soil than other pansies. In pots, use a professional potting mix (not cheap grade potting soil) and make sure there are drainage holes at the bottom of the container. In the ground, pansies perform best in well-prepared "raised" or "mounded" beds that are sure to provide good drainage. You'll find some good instructions for how to prepare a mounded flowerbed here. Fertilization - Feed pansies with a specialty "Pansy Food" or other slow-release flower food that contains "nitrate" forms of nitrogen. Pruning - Occasionally removing faded flowers and their stems from winter through spring will promote more vigorous growth and flowering. Lightly shear lanky stems if needed. Watering - In garden beds water as needed just to keep soil damp, but not wet or too moist. During winter soil doesn't dry out nearly as fast so, with average rainfall, supplemental watering is often not required. Even during dry periods, pansies may only require watering once or twice a week. In containers check water every day and only water if needed. Cool Wave Trailing Pansies combine nicely with ornamental flowering cabbages and kales, snapdragons, diascias, violas, pansies, juncus grasses, parsley, rosemary, heucheras, Autumn fern, dwarf Alberta spruce, and many other cool season plants.